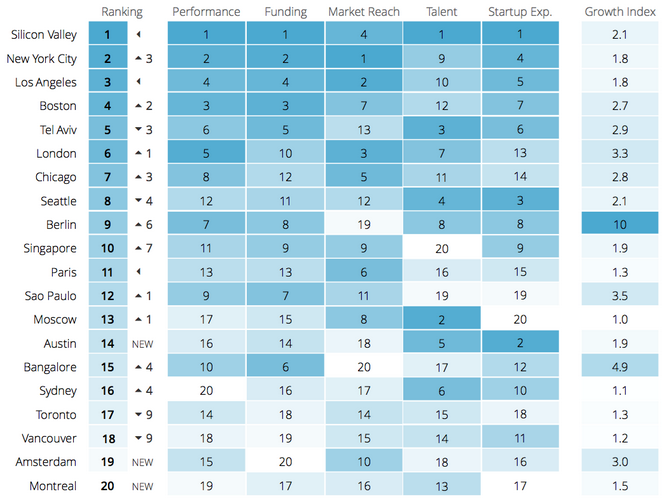 Compass recently published its second report on the global startup ecosystem. The report is the result of more than 200 interviews with entrepreneurs from 25 different countries, 11,000 startup surveys and insight from data partners like CrunchBase, Deloitte and Dealroom, as well as more than 60 local partners. As a local partner of this report, we have encouraged our community of 600 entrepreneurs to contribute. Our CEO, Ray Walia, was also quoted; he summarized Vancouver’s strengths in a couple of sentences. More data was used. The 2015 report benefited from a far larger set of data, which in turn produced a richer and more accurate assessment of each ecosystem. The removal of the mindset index. In the 2012 report, Vancouver ranked No. 2 in mindset, just after Silicon Valley. The addition of Ecosystem Value (the sum of startup valuations at exit and funding events). Though we’re slowly picking this up with the recent acquisitions of PlentyOfFish and Recon, our average seed and Series A funding amounts are 34 percent lower than those in North America. The removal of the metric “number of startups per capita” (a measure of density) from the Performance Index. Mayor Gregor Robertson once said that Vancouver has more entrepreneurs per capita than any city in North America. According to Compass, density is irrelevant to ecosystem performance. Vancouver simply didn’t grow fast enough. Our growth index is 1.2, which puts us behind emerging tech hubs like Bangalore (4.9), Sao Paulo (3.5) and Amsterdam (3.0). It’s also worth noting that this report did not include tech hubs in China, Taiwan, Japan and Korea. The Consolidation of Accelerators: In August 2014, Extreme Startups (Toronto) and GrowLab (Vancouver) announced their merger to form HIGHLINE, the first pan-Canadian accelerator platform. Both accelerators had successes with its portfolio companies, but understood the need to join forces to compete with the top-tier accelerators. Accelerators are in fact a dying business — 90 percent of the 1,700 accelerators around the world did not have an exit. Even a top-tier accelerator, TechStars, realized the need to acquire UpGlobal, Springboard and Excelerate Labs to stay competitive in sourcing deals on a global scale. The Rise of Coding Bootcamps: It was only 18 months ago when Lighthouse Labs taught their first cohort of five students at the back of Launch Academy’s office. Now, more than 380 students have gone through their 8-week intensive coding bootcamp. Following their lead, CodeCore, Red Academy and Brainstation have also made the commitment to address a serious talent gap in the city. It is estimated that Vancouver will have more than 15,500 tech jobs to fill between now and 2019. This is largely because of the increasing presence of major tech giants like Microsoft, Amazon, Facebook, Sony Imageworks and Double Negative in the city. The Dawn of A Globalized Ecosystem: It’s no longer possible to ignore how internationalized our city has become. Tech leaders in Vancouver are pushing the envelope and targeting markets outside of North America. Hootsuite, for example, has more than 10 million users across 175 countries. Impressively, we rank No. 2 in Global Market Reach by having an average of 60 percent foreign customers (62 percent above North American average). With new venture firm Victory Square Ventures bringing a new pool of capital to early stage tech companies and opening doors to international distribution, there is no doubt that Vancouver will remain a popular launch pad for entrepreneurs with a global mindset. It’s an exciting time to be in Vancouver. As the democratization of entrepreneurship continues to take the world by storm, startup entrepreneurs have never been in a better position to build their businesses in Vancouver. We have fantastic and relatively cheaper talent, excellent support infrastructure like Launch Academy, great government programs like IRAP and SR&ED to help startups minimize cost, proximity to the Valley and educational conferences like Traction to ignite a culture of growth. Vancouver is on its way to becoming a top startup ecosystem in the world. More importantly, we have imminent capital flow from the potential IPOs of Hootsuite and Vision Critical, as well as the recent exits of PlentyOfFish, Recon Instruments and Clearly Contacts. Vancouver is heading toward a positive future, but there is much work to do. The 2015 report depicts a far more accurate picture of how Vancouver fares on the global stage. This serves as an excellent benchmark for us to compare from time to time. We as a community need to digest the data, admit our lack of growth and reflect on what we can do better. We need angels/VCs to back more homegrown companies. We need universities to stay current with their curriculum and prepare students for the job market today. We need government to fund grassroots initiatives and events that bring entrepreneurs together. We need corporations to offer startup-friendly services. We need key individuals and thought leaders to make a commitment to build our ecosystem together. 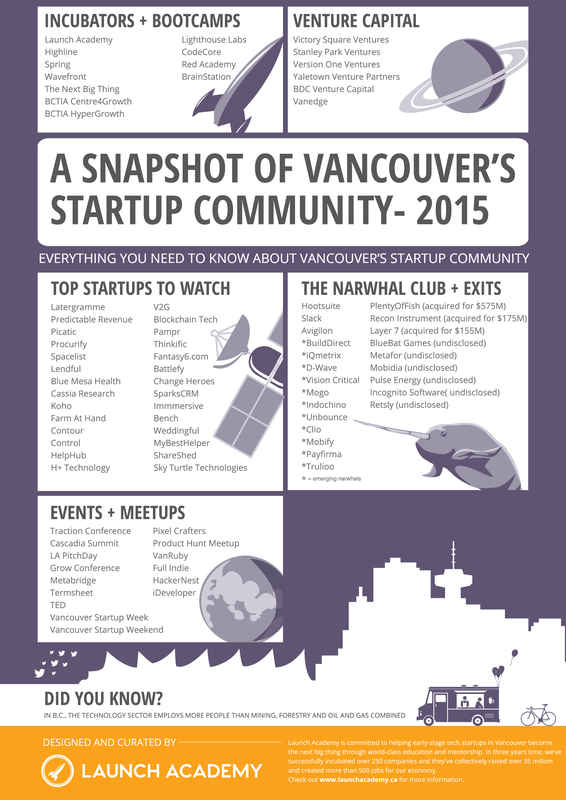 Vancouver is on its way to becoming a top startup ecosystem in the world. All it takes is a little more effort from the entire community. A better ecosystem means more jobs, more competitive salaries and higher quality of life.